Since NBA 2K18 originally released on September 15, up to now, its third patch have been revealed. Glass-half-empty thinkers will focus on the fact that 2K has had to release three patches in less than two weeks. The fixes will hit PS4 and Xbox One on Monday evening and PC and the Nintendo Switch in the near future. When NBA 2K18 launches, have you ever managed to buy NBA 2K18 MT? Users will no longer lose their facial hair when re-scanning their face. Global settings/options will no longer reset to default after entering a MyTeam game. (Switch) Improved framerate/audio syncing during tunnel/locker room scenes in MyCareer. Addressed a hang that could occur when bringing up the squad menu in a completely full Neighborhood. Fixed a soft hang in Live Practice where the ball would not get picked up when using the ball machine. Improved framerate in the court area of the Playground when games are being played on most/all of the courts. Fixed a hang that could occur when the user was scrolling down the list of available shirts in the T-Shirt Kiosk. Generated prospects in future seasons of MyLeague/MyGM will now always have heights appropriate for their position. Free agents 32 years or older will no longer pass up big money offers to sign for the MLE in MyGM/MyLeague. Fixed a case where game framerate would drop for the remainder of the game following a called timeout. Users are now able to view the individual attributes and their values when upgrading their players in MyCareer. (Switch) Fixed an issue that sometimes prevented Local Play from commencing when there were four participants. Fixed an issue where the camera would always point to the middle of the court if the user had the Auto Flip option enabled while in the broadcast camera(s). Addressed a case where Draft-and-Stash players in MyLeague/MyGM would be signed to a $0 contract, while simultaneously being duplicated in the upcoming rookie draft. 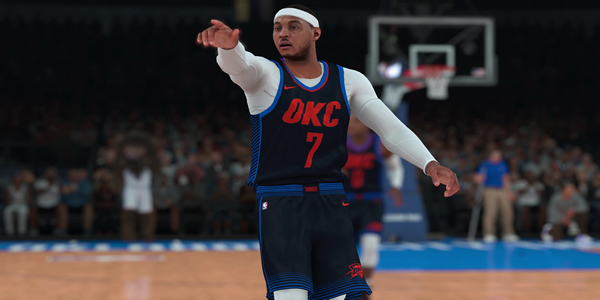 Users will no longer display negative badge progress following an exceptional performance in MyCareer. For those currently experiencing this, continue playing and your tally will be incremented towards your next bonus. More fixes details, reference from here.